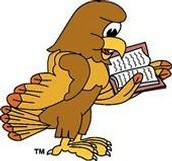 Welcome Prairie View Hawks to the first issue of Beyond the Cover, Prairie View's very own Library Newsletter. With teachers and staff on such a tight time constraint, we felt the need to quickly and easily access the work of the library's engagement, display our developing reading and researching skills techniques, showcase the librarian-to-teacher collaboration, and broadcast highlights, events, tips and recommendations. We are asked, many times, what the future will hold for the library and the librarian's roles. What will happen to libraries? What about the librarian's position? These questions prompted us to develop a newsletter that we can share the progress of our library and it's shifting role into a learning commons, a revolutionized library. A library that teaches our students how to acquire information, contribute findings, work collaboratively, and research diligently; the skills required to make the student a successful member of society.This letter is aiming to answer the question, "So what do you do in the library?" Our goal is to print the newsletter for the student's to view in the libraries, but it doesn't stop there; we will expand to the staff, administrators, and our community.We hope, through four seasonal newsletters, to share the actions that are required to meet our goals, our progress, and our achievement! We are always welcoming feedback and suggestions, please don't hesitate to make requests, and share information with us. 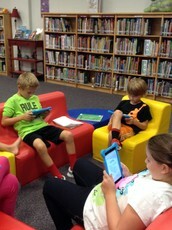 We are currently holding Ereader hour in the library for grades 3-5 on Mondays from 1:45 to 3:15. This dedicated hour(s) allow a more intricate teaching of the Ipad and its Ereading function. The students have both received and signed the Ipad contract and are well award of technology handling procedures. Concurrently, the students are also learning the process of checking in and out Ebooks. The strategy of using an Ereader allows for a great motivation for reading; a strategy this upcoming, technologically savvy generation prefers. Students are able to re-size the text, create notes and highlights, and look up the definition of words, which then transforms the Ereader into a research and comprehension enhancer. Students and teachers...if you are interested in learning more about the power of an Ereader, please make your way down on Mondays. Or if you simply just want to read your Ebook, feel free to make a visit. 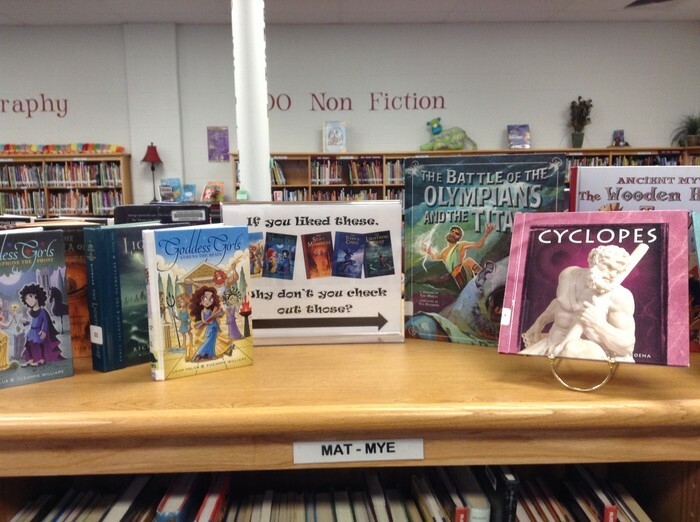 Here in the library we would like to point out our new book displays. This month we are focusing on increasing the readers' interest in Non-Fiction material. With that in mind, we have created a 'If you've read this, you should read that' book display. 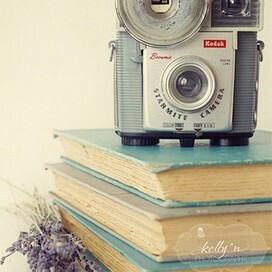 The books are organized to showcase the relationship of the fiction material with true non-fiction accounts. For example, we have an I survived Hurricane Katrina book coupled with the non-fiction book, Hurricanes and Tsunamis. Our goal is to draw the fiction readers to similar (yet still interesting) real, true accounts. We would also like to point out the "Seasonal" display. Found here are books that relate to the seasons or holidays we are currently experiencing. At this time, you will find books about autumn, leaves, apples, and pumpkins, but as we transition into Halloween, you will discover Halloween books have been added to the display. Teachers and students, be looking for the displays. Trust us, you can't miss it! With such an amazing year behind us, we are back and more ready than ever to conquer another year! Library Club applications will be sent out in the beginning of October, giving the students two weeks to fill them out and return them. Remember teachers, the applications request the previous year's signature, stating you vouch for them academically and behaviorally. A drawing will be held to randomly choose this year's Library Club Members, mid October. 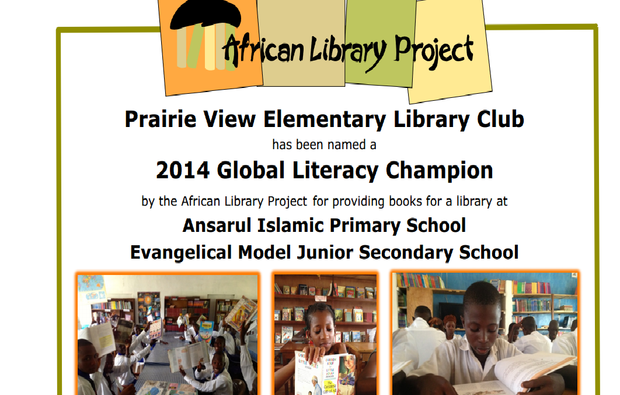 Last year, we raised $1000 and collected 2000 books, and shipped them to Sierra Leone Africa, where two libraries were then built to house the books. The pictures of our libraries are shown below. Also, if you would like to view Library Club's success, complete with the Librarian on the Roof assembly, please check out our district's public drive, specifically PVE's Library Club. This year's philanthropy will be a different, yet just as substantial. Again, we hope to spread the love of literacy worldwide. Be sure to look for Library's Club's progress in following newsletter. Your support was phenomenal last year, we can't thank you enough! Each month, the students will be accustomed and consumed with one specific culture, before they can travel to their next 'location.' Each month is designated a specific area. At the start of this project, volunteers will be invited to stand as the 'guest' for the month's location. During the first week of the month, our library will host an Oh, The Places You Go Story-time event, located in the library. The guest(s) will read a popular Dr. Seuss book in their own personal language to each and every class that week, 27 classes total giving all students the opportunity to experience it. (Our students, even ELL and SPED students, are required to be in specials classes each week, which ensures all student's participation). Our goal is to attain at least three guests per month, which will intermix between the days to volunteer for this project. After the guest reads the story in their native language, they would then read it again in English. After the story is read, the students will be shown different activities that correlate to that specific culture (specifics are provided in the timeline location below). Within the first month of the preparation stage (August), students in the library have already made their passports and cereal box suit cases. As the students undergo each month, they will receive stamps of the locations learned, only after they have filled up their suitcases with a 'Country Report,' a flag, and a "Phrase Page." If interested in volunteering in your child's district...come join us at the upcoming Worldwide Event, mentioned above. It's a terrific opportunity to learn more about our library, our staff and our wonderful students. Shift signups will be available throughout the event, with a variety of fun tasks, you will witness first hand the process of the library on goings. Contact us via email, located at the bottom of the page. Thanks so much for your cooperation! Here in the library, we house the Mark Twain nominee books, 12 wonderful and exciting books that grab our students' attention. In this program, the student is to read at least four of the 12 titles to vote on their favorite title. 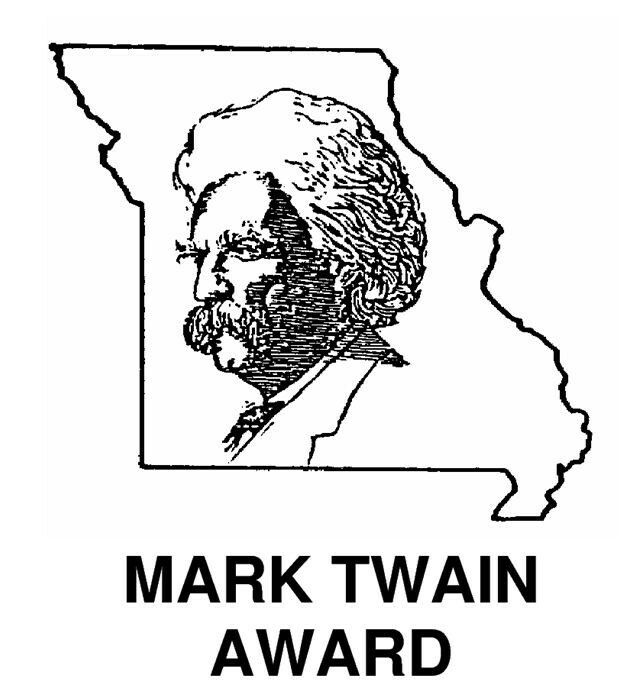 Next year, after all the votes are cast, the Mark Twain Winner will be announced. Our goal stretches farther than that though, we motivate the students, in grades 3-5, to read all twelve books. In doing so, they will earn the title Mark Twain Master, and at the end of the year they get to participate in a pizza and ice cream party. You may have already noticed kids wearing their Mark Twain Master t-shirts that we hand out as an incentive as well. Teachers, remember that if you read a Mark Twain title as a read aloud, this goes towards their 'books read sheet.' Come in and ask us where they are, we will be happy to put one in your hand. Or email us and we can bring it down! 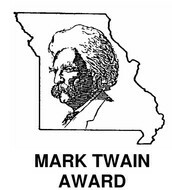 Below is a link that will take you to the Mark Twain site, in which you can read the synopsis and reviews for each book.